THE live crab vending machine – coming to a service station near you! 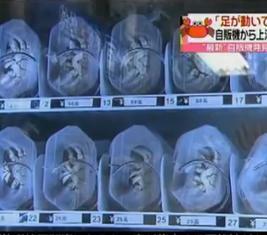 IN Nanjing, China, you can buy a live Shanghai Hairy Crab from a vending machine outside train stations. It’s the emergency pet that guarantees you a seat on the train. The crabs are kept at 5°C, at which temperature they are believed to be in a state of hibernation. Oh, and if you get a dead crab in a bag, the company will replace it with three live ones – enough to kickstart a home zoo. Crabs retails at $1.50 to $7.50 each, depending on size.